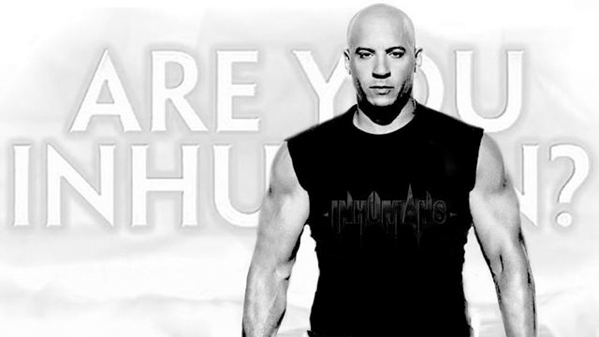 Vin Diesel Again Hints at Role in Marvel's 2018 Project 'Inhumans'? Shortly after Guardians of the Galaxy hit theaters in August, one of the film's voice stars, Vin Diesel, took to Facebook to celebrate the huge success of the Marvel Studios film. And in his post featuring his giant tree character Groot, there seemed to be a hint that the Fast & Furious franchise star may also have a role in another developing project from the comic book movie company. In the aforementioned post, Diesel said, "I get the strange feeling that Marvel thinks I'm Inhuman." And yes, he capitalized the "I" in "Inhuman." And now he's back with a bit more of an obvious hint of a role in the film coming in a few years. More below! That seems like a pretty straightforward hint that he'll have a role in Inhumans, but as who? Well, when Diesel hinted at his involvement in this project the first time around, the most prevailing theory was that of Black Bolt. That character is the leader of the Inhumans, and he's got the unique gift of a voice that can unleash great destruction, so he really doesn't talk much. That would be a rather interesting role since he could be the body and face Black Bolt without speaking (except when he needs to unleash his power), and still lend his voice to Groot without fans getting annoyed that he has two roles in the same Marvel universe. Considering how much Diesel fans loved his work as Groot (even if he only said a handful of words over and over again), surely they'll be even more excited about him having a bigger role in the Marvel universe. Of course, we've got nearly four years until we see Inhumans hit the big screen, so we're betting that more official news on the project is still pretty far out. We haven't even heard about a writer or director being brought on board the film yet, and that's usually a key piece that gets attached to Marvel projects before on-screen talent gets announced. Stay tuned to see what happens. Thoughts? Isn't 4 years until release way to far out for a studio to do casting? Or is it some sort of favor for Diesel? Tell that to Dwayne "Black Adam" Johnson. Vin has to do fast and furious 8, Guardians 2 and inHumans in the next 4 years. Plus they're planting the seeds of the inHumans story on Agents of Shield now... So 4 years isn't too soon at all. I have a feeling we'll see Black Bolt pop up in a Marvel film very soon. I'm just stoked about seeing Blackbolt on the big screen, would seem odd to eventually have Groot and Blackbolt on the same screen if he is indeed going to be Blackbolt. Ha! I love how people are getting nervous about Blackbolt and Groot being together on screen. Seriously people, the two characters are so different (and one of them is CGI anyway) so come on, relax. There will be nothing noticeably similar about them on screen. Does Diesel do mocap work for Groot too? Also, why do people tell this guy anything? He seems to have trouble keeping secrets. Little bit for the face. Oh that is right. I remember seeing that video of him running around on stilts when they started filming. yeah that's just not true. Vin likes to spin a yarn about how involved he is in projects before that's necessarily true. James Gunn did most of the performance capture, especially for the face. Groot is almost entirely Gunn's face and Vin's voice. Why the stilts on set then?